Want to hear from the doctors at the forefront of Obama’s BRAIN initiative? Or, learn about the cutting edge of drone science intended for personal civilian use? Or, get a guided tour inside the Scripps Research Institute and the Sanford Consortium for Regenerative Medicine? Well, you can do all those things at this year’s The Atlantic Meets the Pacific. This third annual conference, presented by The Atlantic Magazine and UC San Diego, gathers top thought leaders in technology and health to discuss their ground breaking research in panels and interviews. This year’s speakers will include top UCSD scientists such as Eric Topol, Todd Coleman, Scott M. Lippman, Jacopo Annese, Ralph J. Greenspan; business and technology leaders like Roni Zeiger and Chris Anderson; and prize winning journalists and authors such as Laurie Garrett, Deepak Chopra, Clifton Leaf, and many many more! The Atlantic Meets the Pacific will take place here at UCSD on October 2 through 4. If you can’t attend, don’t worry! UCSD-TV will be there will to catch all exciting speakers. Can’t wait for the conference? Check out UCSD-TV’s coverage of last year’s The Atlantic Meets Pacific! Watch a video from last year’s The Atlantic Meets the Pacific of Dr. Eric Topol explaining his new medical device that could revolutionize healthcare in a very personal way. What will he talk about this year? 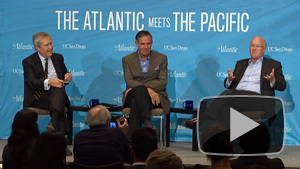 See other videos from UCSD-TV’s coverage of The Atlantic Meets the Pacific!